You. You there. Step right up and take a gander at what I have to offer you. This item right here will change your life...for the better, my friend, for very much the better. Son...son, come back here. I can tell you're a man of substance and character who wants some facts before he opens his wallet. Are you tired of strains, pulls, twinges, tics, twitches, tears, rips...explosions? Do you dislike sharp, dull, throbbing, stabbing, or intermittent pain? Are your thighs so massive and full of rippling muscles that your epidermis is stretched beyond it's limits? Do you wake up in the morning with your legs feeling tired, sore, jelly-like, tingling, or even like they are being stabbed by invisible ninjas? Whoa, whoa, whoa...okay, okay, sir, come back. Sir, come back. Please. I can see now, that you know your ninjas. "Invisible ninjas" is, indeed, redundant. You are correct. But I digress, young man. Do any of these symptoms affect you, or your loved ones, or acquaintances, or possibly teammates? Or more specifically, yours and the many hamstrings you may care about? They do? I thought they may. Then you need to solve your problems with this. What is it, you ask? This, my friend, is what I have come to call, "Hillside's Hamstring Helper". I have traveled the globe talking to doctors, trainers, shamans, healers, medicine men, massage therapists, soccer moms....and even butchers about the infamous and often misunderstood hamstring. I have taken their wisdom and their warnings and combined their various methods of hamstring care, mending, and protection into this vial right here. Son, this little bottle of liquid will cure, heal, repair, pamper, guard, treat, and even armor your valuable Bicep Femoris, Semitendinosus, and Semimembranosus. You will be virtually impenetrable in the posterior section of your upper legs. How much is it? Weeeeell, you just have to think about how much you would be willing to pay for invincibility in your hamstrings? A thousand dollars? Five hundred dollars? Ha! I'm going to practically give this away to you for the low, low price of ninety-nine, ninety-nine. What? You're leaving? All that I just told you, and you are still walking away? I can see you are a tough customer, but toughness won't keep those hammies of yours safe. 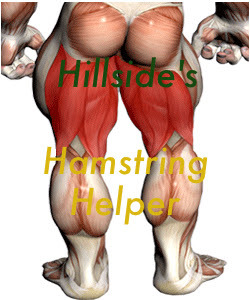 You're gonna want, nay, you're gonna need Hillside's Hamstring Helper. Okay, okay, son. Tell you what. You give me ninety-nine, ninety-nine, and I will throw in another bottle of Hillside's Hamstring Helper absolutely free. No charge whatsoever. You can't beat that deal anywhere, my friend. Not anywhere. That's what I thought. I knew you were smart man and a fierce competitor. A man who cares about himself, but also cares about his compatriots, his teammates. You won't regret this purchase, young man. This product is guaranteed, or your money back, and I give you my word, as a Packers' fan, that it will work. Oh? I didn't mention that I was a Packers' supporter? Well, I guess it just slipped my mind. Shucks, I was just so busy trying to help you out, son. Nevertheless, I will not forget, and neither will you, that those two vials will be the best purchase you ever made. You take care now, my friend. ...Oh, son? You wouldn't happen to be a Packers' supporter, as well, would you? You are? Well, is there any chance you would want to drop my card off at 1265 Lombardi sometime? I'd be much obliged, and it might help us all out. No, thank you, son, and take care of those hammies. Go, Pack.